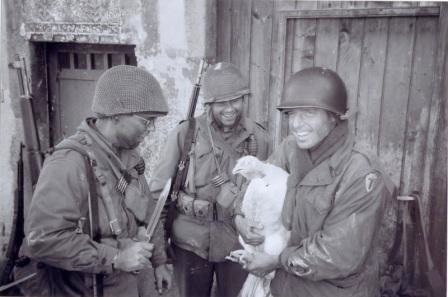 By Dutch reenactment Team "Texas Group", 36th Infantry Division, U.S.A.
Reinforced by members of French reenactment Team "Rock of the Marne", 3rd Infantry Division, U.S.A.
Sunday morning November 12, 1999. Five Dutch men set out for France. Later that day one man leaves the idyllic town of Langres to join the Dutch team. More men will follow later that week. These men have a mission. And the mission is: some darned good world war 2 reenactment on historical battle ground. The destination: a place that was fanatically defended by the Germans against the U.S. 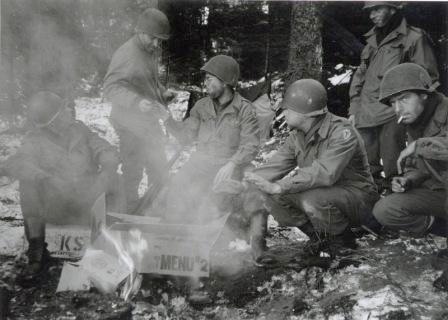 Seventh Army in November 1944; the High Vosges, France. To be more precise, the Anould and Clefcy/Ban-sur-Meurthe area. Two scouts, sent out in September, had found billets in a house tucked away in the woods high above town. This house was not for rent. Ho no, the owners, residents of Anould, insisted we borrow it. It turned out to be a life saver. Audacious plans to see if we could stay out one or two nights in the woods, a shed or foxholes were quickly abandoned. It had been snowing, temperatures were well below freezing so common sense prevailed. Or perhaps we got chicken but we all had jobs to go back to and could not afford to get ill. It was dubbed "Holiday House". Each morning we rose early, or tried to at least, geared up and left for our objective of the day. Each evening we returned to Holiday House for dinner and to discuss the day and make plans for the next day, the next objective. One such objective was what we called "Hilltop House" in Les Granges de Chevremont. One of the few prewar houses left after the fighting of 1944. The house long since abandoned now made a perfect setting for K ration breakfasts. The September scouts had secured permission from the owner to use it as photo backdrop. When checking it out we found an enlisted men's trouser belt and hobnailed French army boots. During the course of the week we made a machine gun outpost near Hilltop House, laid out some "commo" using EE-8 Field Telephones and W-130 Assault Wire from a RL-39 Reel. 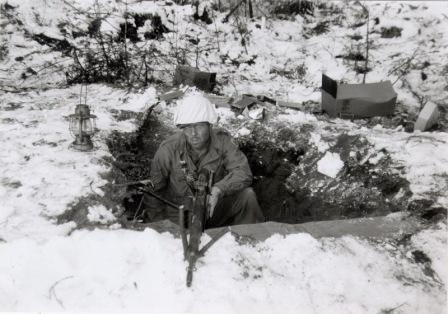 We dug foxholes on the edge of a nearby forest and patrolled into Clefcy to attend a little ceremony to honor the soldiers of the 36th Infantry Division who had liberated the region at such a high cost in human lives and suffering. At the town hall we warmed up and were received by the mayor and deputy mayor who welcomed us with cakes and brandy. Somehow these things do not happen on ordinary holidays. During the hike to Clefcy another good photo location was found, which we quickly dubbed "Turkey Farm". We filled our canteens there and decided to return on Thanksgiving Day, November 25. The September reconnaissance also yielded a wonderful old farm close to where our good friend Freddy lives, at La Chapelle-devant-Bruyères. As it was too far to walk, we only had a week, the lieutenant kindly motored all of us and our gear down there in his brand new Land Rover. One of the walls of the old farm had very recently collapsed. It was still there in September but now the upper floor had a 'Grand View' of the valley. This seemed like a good spot to open the 10-in-1 ration we had made for the occasion. Freddy had mobilized the 'local press' and we willing posed as 'dirty, tired and not interested in the press at all' GI's. Only to glee over the pictures in the newspaper afterwards. That evening replacements came in from a 3rd Division Repple Depple making us a 10 men team. This team concentrated its efforts around another abandoned house we found on our patrols. This "Valley Farm" made a great plaything. In its barn we discovered a GI leather palm glove and an M-1 helmet turned into a shovel. So we were not the first GI's there either. The hayloft was a perfect setting for a 10-in-1 breakfast. We filmed and photographed all morning, doing several small 'scenarios'. Then we marched off to Turkey Farm for more. Once there the proprietress kindly fetched one of her turkeys so we could pose with the beast for a great Thanksgiving picture. During the war our great friend and indispensable help René Durand spent about two weeks at this house as down in the valley where he lived the Germans burned just about every house in their scorched earth withdrawal tactics. We did some more filming during which we wished we would have some blank firing guns to add a little realism to our shooting. The turkeys couldn't care less. They probably like things quiet anyway. And the shots we enjoyed best were those of local hooch so kindly offered by the lady of the house after we were done playing. After bidding our farewells we returned to Holiday House. Here we prepared two dug-outs among the tall pine trees for the last scenes. One of which would be a bonfire of all the now empty ration boxes. Most of the 36th Division got its winter gear early November 1944, it appears. So we wore M43 combat jackets, wool trousers, and either combat boots or shoepacs. Shoepacs really work when it comes to keeping your feet warm. You actually have to take 'm off every now and then to let the sweat dry. They were issued with two pairs of felt insoles, one of which GI's wore in their shirt to dry them out so they could alternate. In theory at least. Derk, our lieutenant, could hardly be persuaded to buy an unissued pair at a recent gun show. Now he had fallen in love with his shoepacs. Of course they should have been issued to some real GI back in '44. They could have saved somebody's feet or life even, back then. Now they comforted us, weekend warriors, make believe soldiers. Even the grime on our hands and faces was just stage make-up. On the way back to Holland we tried to make up by complying with a request by Mr. Fielding Tucker, I Company 143rd Infantry. This year he could not make it across the pond himself. So we visited the American War Cemetery at St. Avold in his place and laid a red rose at the grave of Charley Holm. Charley Holm was killed in action on November 20, 1944, while leading a patrol into St. Leonard. 19 year old Mr. Tucker was assistant squad leader on that same patrol. It felt kind of eerie walking among all those white marble crosses, with all those names, units, only 19 or 20 years between the dates of birth and death. What would they make of us, dressed like they had been dressed when they died. Most of them so much younger than I am now. All we could do was take off our helmets.